The inscription is written in English that seems strange and hard to read to us. It is significant that it was written in English, not Latin, in 1505, well before the Reformation. Here under this marble stone lies Dame Katherine Grey, daughter of Thomas, the late Lord Scales. She married Sir Thomas Grey, knight and banneret, then Richard Lewkenor the elder, of Brambletye. She was one of the ladies-in-waiting to Queen Elizabeth (Woodville), wife of blessed memory to Edward IV, and afterwards to Queen Elizabeth (of York) wife to our Sovereign Lord, Henry VII. She passed out of this transitory world on 18 June 1505. Dame Katherine and her husband Richard were benefactors of East Grinstead church, endowing and ornamenting it, to the laud and honour of God. They also endowed an almshouse for 3 poor men. Jesus, from your utter passion, have mercy upon their souls, Amen. She claimed to be the daughter of Thomas, Lord Scales. He was killed in the ‘Wars of the Roses’ in 1460. She did not inherit his title, so she was probably illegitimate. Whether she had contact with her father, who her mother was, and her birth date are unknown to us. She may have been alive by 1436, because of a bequest to ‘Katherine, daughter of Lord Scales’ including ‘a best goblet and cover silver and gilt, a silver pot, a best bed with sheets and all its furniture’ and a primer, or mass book. So she may have lived from before 1436 to 1505, which is a long life for the times. We do not know who the alleged first husband, Sir Thomas Grey, knight and banneret was. A Sir Thomas Grey was married to someone else. It is possible that the monument makers, or Katherine’s executors, were mistaken, and that she outlived those who knew of her early life. Katherine’s second husband, Richard Lewkenor, acquired Brambletye from his first wife. 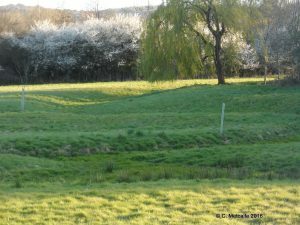 This was not the 17th century ruin that we can see from the lane today, just off the Forest Way, but an earlier building, to the west. 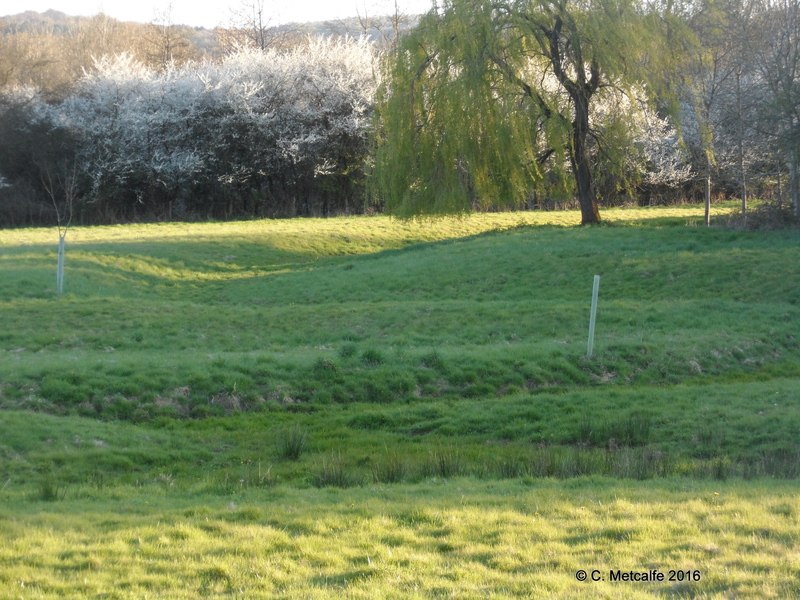 Now Dame Katherine’s manor of Brambletye is just a wooded clump and earthworks in the field. Katherine’s inscription boasts that she served 2 Queens, Elizabeth Woodville (c. 1437-1492), wife of King Edward IV, and Elizabeth of York (c.1466-1503), wife of Henry VII. There is no mention of service to Henry VI’s Queen Margaret, nor to Queen Anne, Queen of Richard III. Possibly it was dangerous to mention service to the court of Richard III during the reign of Henry VII. Elizabeth Woodville’s first husband was Sir John Grey, so she and Katherine may have been kinswomen, if Katherine also married a Grey. It is interesting that Katherine served both Elizabeth Woodville and that Queen’s daughter, Elizabeth of York. Katherine requested burial in front of a statue of Our Lady in the chancel of the north aisle of the parish church of ‘Estgrenested’. She specified ‘my pikture in a wynyng sheet’ (winding sheet or shroud) between her two husbands. 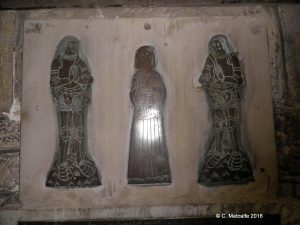 This shows humility, yet she also wanted her executors to provide an inscription ‘shewyng what I was’ with ‘piktures of my two husbandes aftir their honour’, with their escutcheons or coats of arms and hers, so she intended their status to be displayed on the monument. Katherine’s executors patronised a London monumental workshop, identified as Workshop ‘G’ by Miss Rosalind Willats. Katherine’s executors may not have depicted her in a winding sheet, because the eighteenth-century antiquary, Sir William Burrell, who visited ST Swithun’s church shortly before the tower fell, made no mention of such an image. He described a monument of grey Sussex marble in the North aisle, the effigy of a woman between two men, with the arms of Grey over the man on her right, of Lewkenor over the man on her left, and of Scales over the woman. 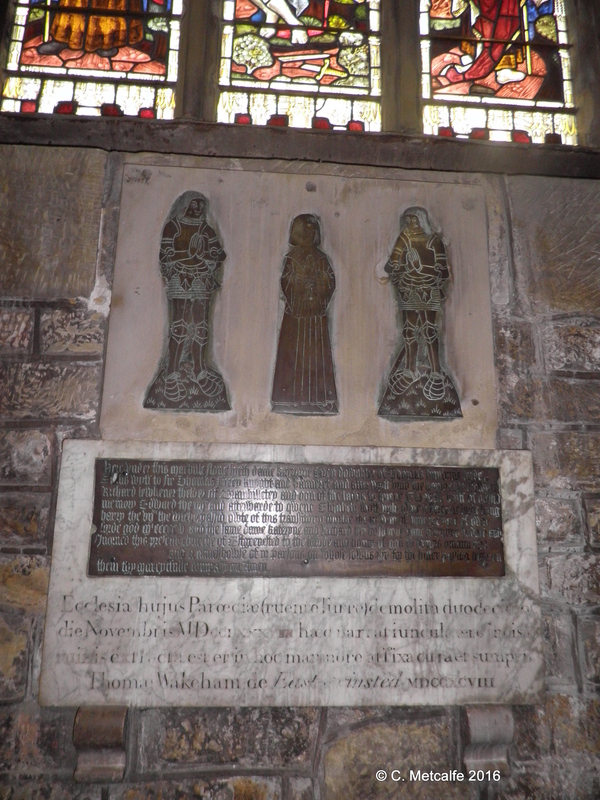 There was clearly still an impressive memorial to Katherine in the church, before the tower fell. Unfortunately for us, he did not draw what he saw. 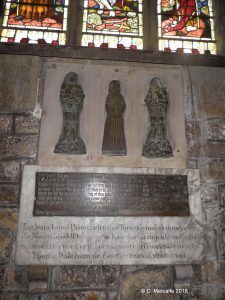 Katherine and her second husband were generous patrons of the church in East Grinstead, contributing to rebuilding and decoration, according to the inscription. She bequeathed gifts to the church ‘to honour God’. A basin and silver ewer were to be made into a cross, and her gowns of silk with furs made into vestments for the church. These gifts show care for the church and its liturgy, and their use would ensure remembrance and prayers for Katherine’s soul. She asked that if the parish could not ‘doo the coste’ of making a cross, her executors should dispose of the silver ewer and basin ‘in other almes deedes for the well of my soule by their discrecioun’. Katherine’s second husband, Lewkenor, had already founded a chantry dedicated to St Mary in the church, endowed with three farms, ‘Boylys’, ‘Harwards’ and ‘Brockhurst’, to pay a priest to sing masses for the soul of Lewkenor and others. Katherine left 6s. 8d. to Chichester cathedral, and 13s. 4d. to the parish church for any unpaid tithes. She asked her executors to commission her tomb and choose suitable scripture. One executor was Dr Thomas Brente, to whom she left ‘my best vestment, a masbooke’ and a chalice’. He had also served Queen Elizabeth Woodville and was a chaplain to Henry VII. This shows Katherine’s court connections and that she had some trusted clergymen around her. Katherine also wanted prayers from the poor, because the prayers of the poor, thought to be closer to God, were considered more powerful. Alms deeds were an important part of funeral arrangements for the wealthy. Katherine prescribed five marks to be given to poor people at her burying and at monthly anniversaries of her death. 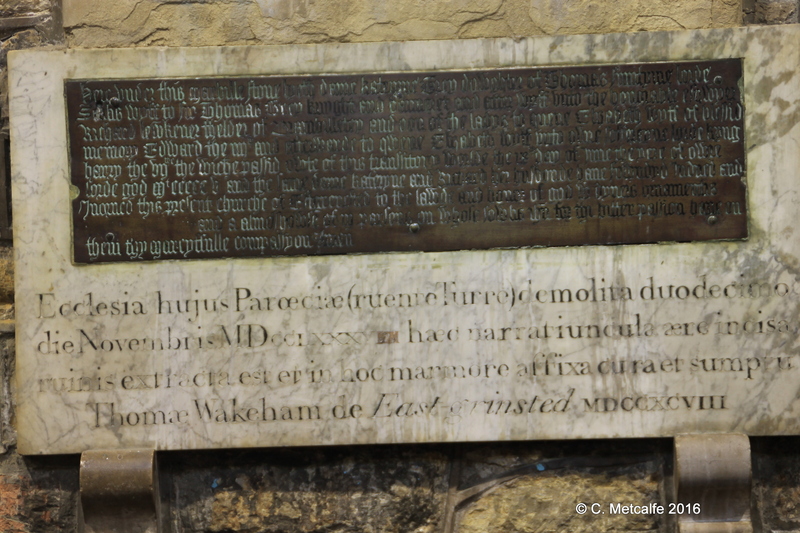 Today, a list of benefactors, under the organ loft, lists Lewkenor and Katherine who ‘gave certain almshouses adjoining East Grinstead common for the use of poor persons’, in 1505. In her will, she asked her executors to attend to the almshouse specified in her husband’s will, to find the land for it and 3 poor men. We do not know whether this almshouse was ever established, but Katherine and her husband hoped for the prayers of poor men. Katherine bequeathed gifts to her ladies, in return for their prayers. They were to receive their wages, further sums, and such horses and harness as she had, and 20s. each upon marriage. She wanted prayers from her own household. There is no mention of any children of Katherine with either husband. Dame Katherine Grey is an enigma, whose origins and early life seem to be lost in the mists of time. She wanted prayers from those close to her and to be shown in her shroud, to help the poor and enhance the church, yet she wanted her high status and court service to be displayed.